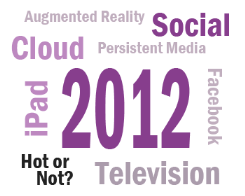 Home > IFS Labs > 2012 – What’s hot, what’s not? With every year end, we like to look forward into the next year and try to see what it holds for us. This year is no exception. So what will 2012 be like in the software industry? What will be hot and what will not? We have the list of predictions just waiting for you, right here. Already in the year of 2011, we’ve seen quite a few “marketing style”-apps that use some elements of reality and adds cartoon like interaction elements on top of the camera view of your phone. All this to have you spend an extra couple of minutes with the company brand. So, will 2012 be the year it makes it into the arena of apps that creates value? Personally, I think it’s too soon. The technology isn’t there yet. However, the hype will just continue to grow. The verdict for Augmented Reality is Hot. The prediction is that the hype will be overwhelming during the next year although we’ll have to wait for real products with real value to hit the street. That said, it’s always fun to see the ideas that come from this one. The most ambitious mockup out there, at the time of writing this, must be this one from Samsung (probably a complete green screen job, but still very cool). Enjoy. Barney Stinson in HIMYM said it already in the late summer of 2011, “Nobody cool is on Facebook anymore”. Now, I’m not that big of a big fan of that show myself, but I couldn’t agree more with that statement. The upcoming Facebook IPO in April of 2012 will surely be fully distributed. Impressive enough, but as with everything that becomes too big, we – the users – will start to refrain from using it. Mostly for reasons beyond the scope of this post but the key phrase here is “lack of anonymity”. The verdict is Not. The prediction is that Facebook will noticeably start its decline in 2012. There are few things, even in the software industry, that have been hyped for so long, delivering (up until a couple of years ago) so little, and still managed to stay interesting, as the cloud. The years of 2010-2011 have been the consolidating years for the cloud concept, and sure enough, we are now seeing quite a few initiatives with real merits using so-called cloud services. In fact, to shamelessly plug our own initiative, I must say that I truly believe we have a one of a kind solution going here at IFS. More about that soon. With that in mind, I also believe that 2012 will be the year that the cloud becomes a household concept as the iCloud have been introduced and people are starting to see the real benefits of having everything in sync. The verdict for the Cloud is Hot. Very Hot. It’s official. The TV is dying. Not the hardware. Quite the opposite on the hardware side. The TV as we have come to know and love since sometime when granddad was born will – if not cease and desist – will forcefully decline in 2012. Sure, there will be those out there who still want to be able to tune in on Thursdays @ 9 for their favorite show, but for most of us, a streaming alternative is the way to go. When we want it, where we want it. The verdict for TV is Not. If TV is dying, persistent media, that was once such a powerful industry, is dead. At least in the way it’s been used for so long. With the Internet, USB-sticks, SSD-drives (basically flash based memory), who needs a CD anymore? With the streaming movies and TV off the internet, who needs DVDs and Blurays? In fact, do you know anyone who buys a Bluray player anymore? If so, please – please! – write about it in the comment section of this site explaining why they felt they needed it. Among all the predictions being made, this one is probably the least controversial. The verdict is Not. Persistent media – may it rest in peace. This one is really a no-brainer. I think most of us, at one time or another, have found that the pad/tablet – when used for what it’s good at e.g. browsing, viewing simple information-styled-apps – is really useful. If only it could be cheaper, lighter, and have even longer battery life. I think that’s in the cards for 2012 and beyond, as is the fact that more “functions” will become apps. Functionality that is part of a bigger system will be extracted from that system into very specific apps, that performs one or a couple of things very well, on the pad. The verdict for the Pad is Hot. That concludes the predictions for 2012. No matter how right or wrong I end up being in these predictions, it’s going to be a very interesting year to come. I look forward to seeing what new hypes will be born, some which we didn’t even see coming at the time of writing this blog post. I also look forward to presenting you with the new and exciting projects we’re working on in IFS Labs. With that, let me wish all of you a happy holiday season 2011.